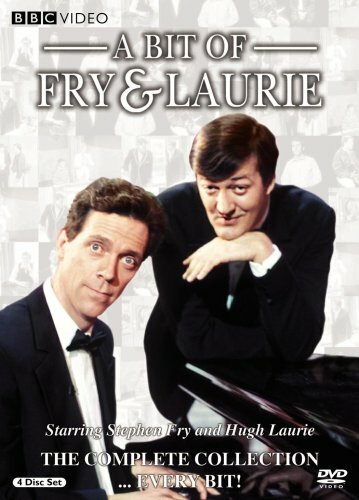 Before Hugh Laurie was House and Stephen Fry hosted QI, the two friends starred in a variety of sketch shows. The most famous is probably A Bit of Fry and Laurie with the others being Alfresco and Saturday Live, which is similar, but not to be confused with Saturday Night Live. The first sketch originally aired in 1987 and was part of Saturday Live. While including it on this list is cheating, the important lesson is that size doesn’t matter and apparently more than one part Stephen’s body is bent. Every Friday, I post a clip from an English speaking country other than the United States. This weeks clip comes from Noel’s House Party. I’ve mentioned the show before. It’s one those shows that isn’t good, but I can’t look away because it’s so ridiculous. In the United States, Noel’s House Party would be relegated to Nickelodeon. To an American, this show looks like it took something meant for kids and pretended it was for adults. The show aired on Saturday nights on the BBC for 8 years in the 90s. In this video, snooker player John Parrot brilliantly cheats at Grab A Grand. You’ve probably seen the same game on Ellen DeGeneres’s talk show under a different name. Grab A Grand puts a contestant into a rectangular box with money flying around and they have to grab as much money as possible in a short period of time. I wish I would have though of that. Parrot’s solution is so simple and obvious, yet I would have never thought of it. Who’s Getting Sent to Room 101? This week I’m going to introduce my fellow American’s to a new British panel or comedy show everyday. Room 101, another show that originated on radio, lets celebrities send people and things to “a fate worse than death.” Since that is the premise of the show, celebrities pick things they don’t like or things they think would make for a funny exchange and good television. Not every object mentions goes into Room 101 because the host has to be persuaded that the object deserves to go into Room 101, which is named for the room in George Orwell’s 1984. Some things that celebrities have chosen to send to Room 101 are American Football, The Beatles, and even the show itself. There have been three hosts of Room 101: Nick Hancock, Paul Merton, and Frank Skinner. The following clip is from the last show ever with Paul Merton and has Ian Hislop trying to send Piers Morgan into Room 101. However, it doesn’t quite work the way as planned. Today’s show is QI or Quite Interesting. Each series (or seasons for Americans) has a different letter of the alphabet determining the topics. For example, series A had shows based around the topics: Aquatic Animals, Advertising, and Antidotes. The incomparable Stephen Fry hosts QI. 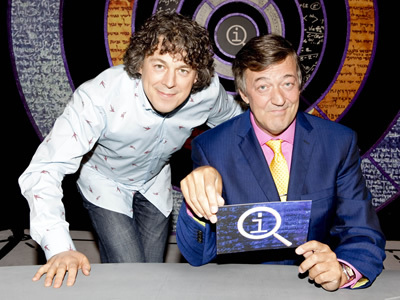 While the adorable Alan Davies is the show’s only permanent panelist, who typically loses by what appears to be a random amount because of QI‘s crazy point system that only a guy named Colin knows the formula for. The following clip has Stephen explain that the grammar rule “I before E except after C” is not as accurate as one would expect. The panel of Graham Norton, Daniel Radcliffe, Lee Mack, and Alan Davies have hard time comprehending what Stephen is saying. Lee Mack has a tougher time than everyone else. Enjoy! After the jump, you will find the QI‘s unbroadcast pilot. As the first episode ever made, it takes place before the set was changed and the current points system was put in place. Alan Davies, Bill Bailey, Eddie Izzard and Kit Hesketh-Harvey are the featured panelists. For American (and possibly some Brits), it will be odd seeing a red-haired Eddie Izzard. I’ve Never Seen Stars Wars, which is based on the BBC Radio 4 series of the same name, is not one of the more popular panel shows. It only ran on BBC Four and BBC Two for 8 episodes in 2008 on and had 1 special in 2011. The original host was Marcus Brigstocke, who I have honestly never heard of before, but has an awesome name. Jo Brand hosted the 2011 special. Both Brigstocke and Brand are good hosts, but I prefer Jo Brand. However, I am extremely biased toward anything with Stephen Fry, who is the guest in that episode, so don’t let my opinion sway you. Many of the celebrities are not well-known to Americans with the exception of maybe Stephen Fry and Clive Anderson, who was the host of the British version of Whose Line is it Anyway?. Despite not knowing the guest celebrities well, the show is still very funny. The following clips are from Marcus Brigstocke’s run as host and features Clive Anderson as a guest. Click the link below to see the second and third part of the episode.